Arizona Grantmakers Forum held its first program of the fall to launch The Values Series, a sequence of programs and workshops designed to inform and inspire you to approach your work in new ways. Our values—Integrity, Collaboration, Community Stewardship, Diversity & Inclusion and Transformation—are central to our educational programming as we pursue our mission to empower our members to transform Arizona through leadership and meaningful philanthropy.We began with the value of Transformation to explore the latest efforts to improve education in Arizona. Now that voters have approved a ballot measure to invest $3.5 billion in new funding into K-12 education, we heard from an expert about what’s next, beyond Proposition 123. Back to School featured Pearl Chang Esau of Expect More Arizona who addressed Arizona’s education landscape now that voters have passed Prop. 123 and walked us through the Arizona Education Progress Meter, a tool that captures key milestones on the path to improving educational opportunities and outcomes for all Arizonans. The progress meter utilizes the most current data available to create a simple, visual way to assess the status of education, both for the state as a whole and for the individual counties where available. Attendees gained a better understanding of what it takes for Arizona students to succeed and how their organizations can be a part of this transformation. 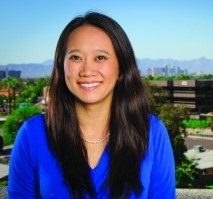 Pearl Chang Esau is the president and chief executive officer of Expect More Arizona, a nonpartisan, nonprofit education advocacy organization working to build a movement for world-class education early years through career, for every Arizona student.Esau began her career in education as a Teach For America corps member, teaching fifth grade English language learners in East Los Angeles. This role inspired her to dedicate her life to helping all students reach their potential through an excellent education. View Pearl Chang Esau’s presentation slides here. This program was only open to AGF members. This entry was posted in PastPrograms2016 on August 30, 2016 by Kim Garbacz.